This model finishes out my contribution to the Storm Wardens/Doctors Without Borders project. Actually, all my models are boxed up and being shipped out to the rally point right now. The idea for the image came from talking with the guys over at Fantsy Flight Games. I think it works, but sometimes I wonder if a simple "icon" would have done the trick just as well. Doing images like this and not icons (like a simple lightning bolt) means you have to look into the background a little bit and not everyone always agrees on that stuff. There's always the chance that someone won't like it or agree with the imagery chosen. The Terminator honors hangs from the top of the banner on a silver cord to add a little gold up top (in addition to the Eagle) and help solidify the banner to the banner pole. It's a cosmetic way to make the model sturdy enough to stand up to gaming. Should find some way to work that into the banner shouldn't I? Going with the "image" idea and not the icon approach, I probably should have the Chapter symbol on there at least once. This is to represent all of the different artists who worked on the project and shows that we are scattered among the stars but brought together for the project. Lots of flowers and kittens and happiness here. Some text explaining the whole project. It starts with the letter =I= as a nod to the Inquisition and the upcoming RPG Deathwatch being put out by Fantasy Flight Games. The back of the banner has a long scroll attached to it to break up the huge area of blue and act a little visual variety for the guy fielding the model since he'll never get to see the front of it... his opponent will always be looking at it from across the table. And the model is painted like the rest of them according to the color scheme laid down by the Codex. I added a few lightning bolts to him in addition to the chapter specific sculpted shoulderpad. If you haven't had a chance to see the whole army so far, cruise over to the Storm Wardens blog and look at the army collage to see all of the units in the army. If you haven't donated yet, I'm not sure what to say at this point. An army like this is amazing and to help a cause like Doctors Without Borders makes it even better. Make sure you donate, the deadline is this weekend (July 18th). You could win this amazing army. Even if you don't walk away with the army, you helped us to help a great cause. How to "build" a banner similar to this can be found here. Simply jaw-dropping Ron, very well done, very impressive to say the least. All kittens aside, the "artist constellation" image is an incredibly nice touch to say the very least. I've been following your blog, sheesh, pretty much forever, it's what started me blogging about 40k in the first place. I must say this is one of my favorite pieces I've had the pleasure of witnessing on here for a whole host of reasons. Ron, when I thought of doing this, part of it was sort of removing the competitive part of the hobby, If this was a miniatures contest and I was entered against you, I would be so pissed that this is this cool, but now I am just super stoked. It looks so FREAKING cool!! No idea what else to say, can't say anything negative about the banner, it's amazing!!! Excellent job as always Ron - I really admire you banner work. The serpents on the banner are suggestive (to me) of the Alpha Legion - I like it very much! Awesome job, as always Ron. And what's more, your work is always a great inspiration to us out there to improve our own work. I take my hat off, good sir. Wow, I must say, this is the best banner I've seen in a while! Wish I had some to make, myself. Heh. Love it! Thanks guys, I appreciate the compliments. Hopefully it'll make a nice addition to the command squad and see a good amount of time on the tabletop with it's final owner. That is an excellent model and the freehand is amazing, this will truly be an awesome addition to the Storm Warden army! Ron that is absolutely fantastic! That soldier will truly be a centrepiece for the army! 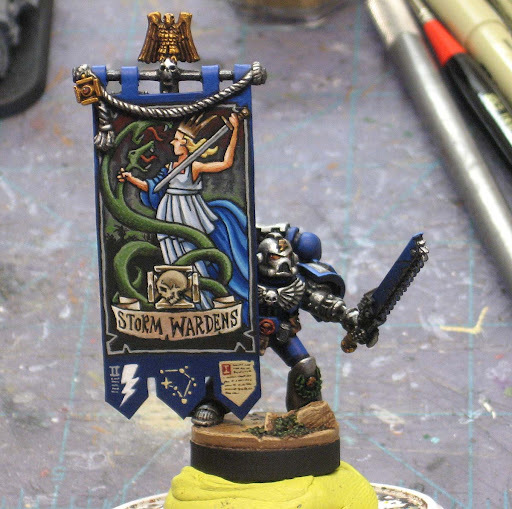 I noticed from your wip post you intended to do a quick NMM tutorial, I was wondering if you had any plans to do a tutorial on the actual construction of the banner? If not a quick step by step would be fantastic! Lloyd: I do plan on doing a "NMM 101" type post to cover the handful of things I learned while just painting the small icon. That will come along in the next couple weeks. As for actually "constructing" a banner like this, I added a link at the end of the post to the tutorial that will take you step by step through the process I used for this one. Always amazing banner/free-hand work, Ron. I love the imagery, and think it breathes much more life into the project/army than if you were to simply go with icon. Well done. Thanks for the link Ron - I'll have to get on this one over the weekend and see what I come up with...also good work on putting your design thoughts on the post - really helps others to get a design flow going to produce their own stuff!! Lloyd: No problem... I'm doing what I can to add as many links to members that have contributed relevant articles to the tutorials section. It helps support you guys.